Bulawayo is the second largest city in Zimbabwe, and the largest city in the country's Matabeleland. The city's population is disputed; the 2012 census listed it at 653,337, while the Bulawayo City Council claimed it to be about 1.2 million. Bulawayo covers an area of about 1,707 square kilometres (659 sq mi) in the western part of the country, along the Matsh' Amhlope River. Along with the capital Harare, Bulawayo is one of two cities in Zimbabwe that are also a province. The Limpopo River rises in South Africa, and flows generally eastwards to the Indian Ocean in Mozambique. The term Limpopo is derived from Rivombo (Livombo/Lebombo), a group of Tsonga setters led by Hosi Rivombo who settled in the mountainous vicinity and named the area after their leader. 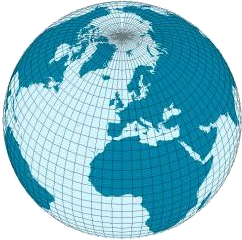 The river is approximately 1,750 kilometres (1,087 mi) long, with a drainage basin 415,000 square kilometres (160,200 sq mi) in size. The mean discharge measured over a year is 170 m3/s at its mouth. 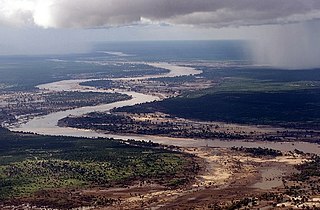 The Limpopo is the second largest river in Africa that drains to the Indian Ocean, after the Zambezi River. Around the 10th and 11th centuries the Bantu-speaking Bakalanga arrived from the south and settled in Mapungubwe on the Limpopo and Shashi river valleys. Later they moved north to Great Zimbabwe. By the 15th century, the Bakalanga had established a strong empire at Khami under a powerful ruler called Dlembeu . This empire was split by the end of the 15th century and were later conquered by the Nguni people. The Bantu languages technically the Narrow Bantu languages, as opposed to "Wide Bantu", a loosely defined categorization which includes other "Bantoid" languages, are a large family of languages spoken by the Bantu peoples throughout Sub-Saharan Africa. Khami is a ruined city located 22 kilometres west of Bulawayo, in Zimbabwe. It was once the capital of the Kalanga Kingdom of Butwa of the Tolwa dynasty. It is now a national monument, and became a UNESCO World Heritage Site in 1986. In the late 1830s, Mzilikazi Khumalo, led a group of Nguni and other tribes into the Lozvi Empire of the Bakalanga. Many of the Bakalanga people were incorporated to create a large state called Mthwakazi Kingdom. Mthwakazi, a Zulu word which means "something which becomes big at conception", in Zulu "into ethe ithwasa yabankulu" but the territory was called Matabeleland by Europeans. Mzilikazi organised this ethnically diverse nation into a militaristic system of regimental towns and established his capital at Bulawayo ("the place of killing"). Mzilikazi was a statesman of considerable stature, able to weld the many conquered tribes into a strong, centralised kingdom. Mzilikazi was a Southern African king who founded the Matabele Kingdom (khumalo), Matabeleland, in what became British South Africa Company-ruled Rhodesia and is now Zimbabwe. His name means "the great road". He was born the son of Matshobana near Mkuze, Zululand, and died at Ingama, Matabeleland. Many consider him to be the greatest Southern African military leader after the Zulu king Shaka. David Livingstone, in his autobiography, referred to Mzilikazi as the second most impressive leader he encountered on the African continent. The Nguni people are a group of Bantu peoples who primarily speak Nguni languages and currently reside predominantly in Southern Africa. The Nguni people are Xhosa, Zulu, Shangaan, Ndebele and Swati people. They predominantly live in South Africa. Swati people live in both South Africa and Eswatini, while Ndebele and Xhosa people live in both South Africa and Zimbabwe. In South Africa, the historic Nguni kingdoms of the Xhosa, Zulu, Ndebele, Shangaan and Swazi lie on the present provinces of the Eastern Cape, KwaZulu-Natal, and Mpumalanga. The most notable of these kingdoms is the Zulu Kingdom, which was ruled by Shaka kaSenzangakhona, a powerful warrior king whose conquest took place in the early nineteenth century. In Zimbabwe, the Ndebele people live primarily in Matebeleland, Bulawayo, and Midlands. Mthwakazi is the traditional name of the proto-Ndebele and Ndebele kingdom that existed until the end of the 19th century within the area of today's Zimbabwe. Mthwakazi is widely used to refer to inhabitants of Matebeleland and Midlands provinces in Zimbabwe. In 1852, the Boer government in the Transvaal made a treaty with Mzilikazi. In 1867 gold was discovered in northern Mthwakazi, this area widely settled by the Zezuru people, remnants of the Mwenemutapa kingdom , and the European powers became increasingly interested in the region. Mzilikazi died on 9 September 1868, near Bulawayo. His son, Lobengula, succeeded him as king. In exchange for wealth and arms, Lobengula granted several concessions to the British, but it was not until twenty years later that the most prominent of these, the 1888 Rudd Concession gave Cecil Rhodes exclusive mineral rights in much of the lands east of Lobengula's main territory. Gold was already known to exist, so with the Rudd concession, Rhodes was able, in 1889, to obtain a Royal Charter to form the British South Africa Company. Boer is the Dutch and Afrikaans noun for "farmer". In South African contexts, "Boers" refers to the descendants of the then Dutch-speaking settlers of the eastern Cape frontier in Southern Africa during the 18th and much of the 19th century. From 1652 to 1795 the Dutch East India Company controlled this area, but the United Kingdom incorporated it into the British Empire in 1806. The South African Republic, also referred to as the Transvaal Republic, was an independent and internationally recognised country in Southern Africa from 1852 to 1902. The country defeated the British in what is often referred to as the First Boer War and remained independent until the end of the Second Boer War on 31 May 1902, when it was forced to surrender to the British. After the war the territory of the ZAR became the Transvaal Colony. Inkos'uLobengula Khumalo (1845–1894) was the second and last king of the Northern Ndebele people. Both names, in the isiNdebele language, mean "the men of the long shields", a reference to the Ndebele warriors' use of the Zulu shield and spear. In 1890, Rhodes sent a group of settlers, known as the Pioneer Column, into Mashonaland where they founded Fort Salisbury (now Harare). In 1891 an Order-in-Council declared Matabeleland and Mashonaland British protectorates. Rhodes had a vested interest in the continued expansion of white settlements in the region, so now with the cover of a legal mandate, he used a brutal attack by Ndebele against the Shona near Fort Victoria (now Masvingo) in 1893 as a pretext for attacking the kingdom of Lobengula. Also in 1893, a concession awarded to Sir John Swinburne was detached from Matabeleland to be administered by the British Resident Commissioner of the Bechuanaland Protectorate, to which the territory was formally annexed in 1911 and it remains part of modern Botswana, known as the Tati Concessions Land. The Pioneer Column was a force raised by Cecil Rhodes and his British South Africa Company in 1890 and used in his efforts to annex the territory of Mashonaland, later part of Southern Rhodesia. 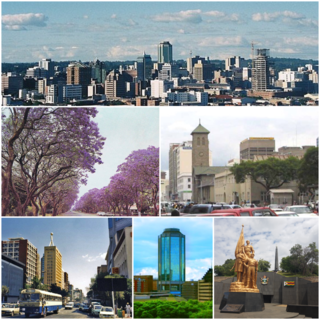 Harare is the capital and most populous city of Zimbabwe. The city proper has an area of 960.6 km2 (371 mi2) and an estimated population of 1,606,000 in 2009, with 2,800,000 in its metropolitan area in 2006. Situated in north-eastern Zimbabwe in the country's Mashonaland region, Harare is a metropolitan province, which also incorporates the municipalities of Chitungwiza and Epworth. The city sits on a plateau at an elevation of 1,483 metres above sea level and its climate falls into the subtropical highland category. Mashonaland is a region in northern Zimbabwe. It is the native place of the Shona people. The first decisive battle was fought on 1 November 1893, when a laager was attacked on open ground near the Bembesi River by Imbizo and Ingubo regiments. The laager consisted of 670 British soldiers, 400 of whom were mounted along with a small force of native allies, and fought off the Imbizo and Ingubo forces, which were considered by Sir John Willoughby to number 1,700 warriors in all. The laager had with it small artillery: 5 Maxim guns, 2 seven-pounders, 1 Gardner gun, and 1 Hotchkiss gun. The Maxim machine guns took center stage and decimated the native force at the Battle of the Shangani. Although Lobengula's forces totaled 80,000 spearmen and 20,000 riflemen, versus fewer than 700 soldiers of the British South Africa Police, the Ndebele warriors were not equipped to match the British machine guns. Leander Starr Jameson sent his troops to Bulawayo to try to capture Lobengula, but the king escaped and left Bulawayo in ruins behind him. An attempt to bring the king and his forces to submit led to the disaster of the Shangani Patrol when a Ndebele Impi defeated a British South Africa Company patrol led by Major Allan Wilson at the Shangani river in December 1893. Except for Frederick Russell Burnham and two other scouts sent for reinforcements, the detachment was surrounded and wiped out. This incident had a lasting influence on Matabeleland and the colonists who died in this battle are buried at Matobo Hills along with Jameson and Cecil Rhodes. In white Rhodesian history, Wilson's battle takes on the status of General Custer's stand at Little Big Horn in the United States. The Matabele fighters honoured the dead men with a salute to their bravery in battle and reportedly told the king, "They were men of men and their fathers were men before them." Lobengula died in January 1894, under mysterious circumstances; within a few short months the British South Africa Company controlled Matabeleland, and white settlers continued to arrive. In March 1896, the Ndebele revolted against the authority of the British South Africa Company in what is now celebrated in Zimbabwe as the First Chimurenga, i.e., First War of Independence. Mlimo, the Ndebele spiritual/religious leader, is credited with fomenting much of the anger that led to this confrontation. He convinced the Ndebele that the white settlers (almost 4,000 strong by then) were responsible for the drought, locust plagues and the cattle disease rinderpest ravaging the country at the time. Mlimo's call to battle was well-timed. Only a few months earlier, the British South Africa Company's Administrator General for Matabeleland, Leander Starr Jameson, had sent most of his troops and armaments to fight the Transvaal Republic in the ill-fated Jameson Raid. This left the country's security in disarray. In June 1896, the Shona too joined the war, but they stayed mostly on the defensive. The British would immediately send troops to suppress the Ndebele and the Shona, only it would take months and cost many hundreds of lives before the territory would be once again be at peace. Shortly after learning of the assassination of Mlimo at the hands of the American scout Frederick Russell Burnham, Cecil Rhodes showed great courage when he boldly walked unarmed into the Ndebele stronghold in Matobo Hills and persuaded the impi to lay down their arms, thus bringing the war to a close in October 1896. Matabeleland and Mashonaland would continue on only as provinces of the larger state of Rhodesia. British settlement of Rhodesia continued, and by October 1923, the territory of Southern Rhodesia was annexed to the Crown. The Ndebele thereby became British subjects and the colony received its first basic constitution and first parliamentary election. Ten years later, the British South Africa Company ceded its mineral rights to the territory's government for £2 million. The deep recession of the 1930s gave way to a post-war boom of British immigration. After the onset of self-government, a major issue in Southern Rhodesia was the relationship between the white settlers and the Ndebele and Shona populations. One major consequence was the white settlers were able to enact discriminatory legislation concerning land tenure. The Land Apportionment and Tenure Acts reserved 45% of the land area for exclusively white ownership. 25% was designated "Tribal Trust Land", which was available to be worked on a collective basis by the already settled farmers and where individual title was not offered. In 1965, the white government of Rhodesia, led by Prime Minister Ian Smith, declared its independence from Britain — only the second state to do so, the other being the USA in 1776. Initially, this state maintained its loyalty to Queen Elizabeth II as "Queen of Rhodesia" (a title to which she never consented), but by 1970 even that link was severed, and Rhodesia became a totally independent republic. The white-ruled Rhodesian government struggled to obtain international recognition and faced serious economic difficulties as a result of international sanctions. Some states did support the white minority government of Rhodesia, most notably South Africa and Portugal. In 1972, the Zimbabwe African National Union began a lengthy armed campaign against Rhodesia's white minority government in what became known as the "Bush War" by White Rhodesians and as the "Second Chimurenga" (or rebellion in Shona) by supporters of the rebels. The Ndebele, backed by Moscow, set up a separate war front from neighbouring Zambia. The Rhodesian government agreed to a ceasefire in 1979. For a brief period, Rhodesia reverted to the status of British colony, until early 1980 when elections were held. The ZANU party, led by the Shona independence leader Robert Mugabe, defeated the popular Ndebele candidate Joshua Nkomo, solidified their rule over independent Zimbabwe. Matabeleland and Mashonaland continued as provinces of this new nation. Following independence in 1980, Zimbabwe initially made significant economic and social progress, but tensions between the Shona and the Ndebele began to surface. The government responded with a series of military campaigns in which the North Korean-trained 5th brigade killed tens of thousands of civilians in Matabeleland. By early 1984, the army disrupted food supplies in Matabeleland and much of the Ndebele population suffered food shortages. Robert Mugabe and Joshua Nkomo finally reconciled their political differences by late 1987. The roots of discord remained, however, and in some ways increased as Mugabe's rule became increasingly autocratic into the 21st century. The Matobo National Park forms the core of the Matobo or Matopos Hills, an area of granite kopjes and wooded valleys commencing some 35 kilometres (22 mi) south of Bulawayo, southern Zimbabwe. The hills were formed over 2 billion years ago with granite being forced to the surface, this has eroded to produce smooth "whaleback dwalas" and broken kopjes, strewn with boulders and interspersed with thickets of vegetation. Mzilikazi, founder of the Ndebele nation, gave the area its name, meaning 'Bald Heads'. The Northern Ndebele people are a Bantu nation and ethnic group in Southern Africa, who share a common Ndebele culture and Ndebele language. The Northern Ndebele were historically referred to as the Matabele which was a seSotho corruption of 'Ndebele'. Their history began when a Zulu chiefdom split from King Shaka in the early 19th century under the leadership of Mzilikazi, a former chief in his kingdom and ally. Under his command the disgruntled Zulus went on to conquer and rule the chiefdoms of the Southern Ndebele. This was where the name and identity of the eventual kingdom was adopted. See also: 1880s in Zimbabwe, 1900 in Zimbabwe and Years in Zimbabwe. The First Matabele War was fought between 1893 and 1894 in modern day Zimbabwe. It pitted the British South Africa Company against the Ndebele (Matabele) Kingdom. Lobengula, king of the Ndebele, had tried to avoid outright war with the company's pioneers because he and his advisors were mindful of the destructive power of European-produced weapons on traditional Matabele impis attacking in massed ranks. Lobengula reportedly could muster 80,000 spearmen and 20,000 riflemen, armed with Martini-Henry rifles, which were modern arms at that time. However, poor training meant that these were not used effectively. The Second Matabele War, also known as the Matabeleland Rebellion or part of what is now known in Zimbabwe as the First Chimurenga, was fought between 1896 and 1897 in the area then known as Rhodesia, now Zimbabwe. It pitted the British South Africa Company against the Matabele people, which led to conflict with the Shona people in the rest of Rhodesia. The military history of Zimbabwe chronicles a vast time period and complex events from the dawn of history until the present time. It covers invasions of native peoples of Africa, encroachment by Europeans, and civil conflict. Allan Wilson was an officer in the Victoria Volunteers. He is best known for his leadership of the Shangani Patrol in the First Matabele War. His death fighting overwhelming odds made him a national hero in Britain and Rhodesia. The colonial history of Southern Rhodesia is considered to be a time period from the British government's establishment of the government of Southern Rhodesia on 1 October 1923, to Prime Minister Ian Smith's unilateral declaration of independence in 1965. The territory of 'Southern Rhodesia' was originally referred to as 'South Zambezia' but the name 'Rhodesia' came into use in 1895. The designation 'Southern' was adopted in 1901 and dropped from normal usage in 1964 on the break-up of the Federation of Rhodesia and Nyasaland, and Rhodesia became the name of the country until the creation of Zimbabwe Rhodesia in 1979. 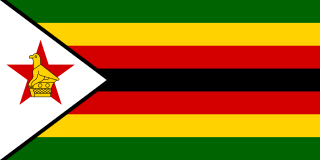 Legally, from the British perspective, the name Southern Rhodesia continued to be used until 18 April 1980, when the name Republic of Zimbabwe was formally proclaimed. Patrick William Forbes was a leader of the paramilitary British South Africa Police, who commanded a force that invaded Matabeland in the First Matabele War. White people first came to the region in southern Africa today called Zimbabwe in the sixteenth century, when Portuguese colonials ventured inland from Mozambique and attacked the Kingdom of Mutapa, which then controlled an area roughly equivalent to eastern Zimbabwe and western Mozambique. Portuguese influence over Mutapa endured for about two centuries before fading away during the 1690s and early-1700s (decade). During the year of 1685, French Huguenots emigrated to present-day South Africa and whilst some settled there, others moved further north into the continent. Those who did, settled within modern-day Zimbabwe, Mozambique and Botswana, and co-existed with the indigenous people; most of whom, in Zimbabwe, were the Naletale people. Shangani Patrol is a war film based upon the non-fiction book A Time to Die by Robert Cary (1968), and the historical accounts of the Shangani Patrol, with Brian O'Shaughnessy as Major Allan Wilson and Will Hutchins as the lead Scout Frederick Russell Burnham. Also includes the song "Shangani Patrol" by Nick Taylor. The Shangani Patrol was a 34-soldier unit of the British South Africa Company that in 1893 was ambushed and annihilated by more than 3,000 Matabele warriors in Rhodesia, during the First Matabele War. 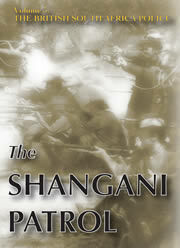 Headed by Major Allan Wilson, the patrol was attacked just north of the Shangani River in Matabeleland, Rhodesia. Its dramatic last stand, sometimes called "Wilson's Last Stand", achieved a prominent place in the British public imagination and, subsequently, in Rhodesian history, similarly to events such as the Battle of Shiroyama in Japan, the Battle of the Alamo in Texas and the Greeks' last stand at Thermopylae. The British South Africa Company's administration of what became Rhodesia was chartered in 1889 by Queen Victoria of the United Kingdom, and began with the Pioneer Column's march north-east to Mashonaland in 1890. Empowered by its charter to acquire, govern and develop the area north of the Transvaal in southern Africa, the Company, headed by Cecil Rhodes, raised its own armed forces and carved out a huge bloc of territory through treaties, concessions and occasional military action, most prominently overcoming the Matabele army in the First and Second Matabele Wars of the 1890s. By the turn of the century, Rhodes's Company held a vast, land-locked country, bisected by the Zambezi river. It officially named this land Rhodesia in 1895, and ran it until the early 1920s. ↑ Musemwa, Muchaparara (Sep 2006). "Disciplining a 'Dissident' City: Hydropolitics in the City of Bulawayo, Matabeleland, Zimbabwe, 1980–1994". Journal of Southern African Studies . Routledge: 239–254. doi:10.1080/03057070600656119. ↑ The Kingfisher Illustrated History of the World. Italy: Kingfisher. 1993. p. 558. ISBN 9780862729530. ↑ Burnham, Frederick Russell (1926). Scouting on Two Continents. Doubleday, Page & company. pp. 2, Chapters 3 & 4. OCLC 407686. ↑ DeGroot, E.B. (July 1944). "Veteran Scout". Boys' Life . Boy Scouts of America: 6–7. Retrieved 2010-07-16. ↑ Jeal, Tim (1989). Baden-Powell. London: Hutchinson. ISBN 0-09-170670-X. ↑ Baden-Powell, Robert (1908). Scouting for Boys: A Handbook for Instruction in Good Citizenship. London: H. Cox. xxiv. ISBN 0-486-45719-2. ↑ Proctor, Tammy M. (July 2000). "A Separate Path: Scouting and Guiding in Interwar South Africa". Comparative Studies in Society and History. 42 (3). ISSN 0010-4175. ↑ Forster, Reverend Dr. Michael. "The Origins of the Scouting Movement" (DOC). Netpages. Retrieved 2007-10-02.